It feels like we’ve been waiting an especially long time for a new Maryse Smith record. Her debut, Is Becomes Was, was released in late 2009 and instantly established her as one of the state’s most promising songbirds. A follow-up EP with her then backing band, the Rosesmiths, was rumored to hit eager ears in 2010 but never materialized, leaving smitten audiences waiting in anxious anticipation lo, these past three years. But some things really are worth the wait. Smith’s newly released, self-titled sophomore record is a remarkable effort, revealing a mature and deeply thoughtful songwriter in full command of her considerable powers. Smith’s debut was a humble and winsome affair composed of her earliest songwriting. Almost impossibly charming, it exuded a warm, handmade quality as inviting as it was intoxicating. It was imperfect, but perfectly so. The album’s blemishes and quirks, combined with Smith’s own seeming shyness and insecurity as a songwriter, gave the record a wonderfully human, familiar feel. On her eponymous new record, Smith has grown up. From the outset, the strutting, early rock-and-roll strains of “Garden Flower,” she sings with newfound swagger. It’s a sly confidence. But behind that teasing, seductive grin are sharp teeth and equally sharp wordplay. It’s precisely that incisive and insightful bite that suggests Smith has entered a new artistic phase. The characteristic melancholy of her debut lingers, but it’s girded with attitude, as though she has a chip on her newly straightened shoulders. Adding to that air of confidence are Smith’s backing mates, including, in various forms, Nocturnals guitarist Benny Yurco, upright bassist Pat Melvin, drummer Ryan Hayes and ex-Rosesmith Paddy Reagan, also on drums. Ryan Power, who produced and engineered the album, turns up on a variety of instruments, as well. Collectively, they provide a sturdy backdrop, filling the space around Smith’s finely crafted new songs with tact and nuance. But Smith is the focus, and rightly so. Whether unloading on old flames (“Garden Flowers”), confessing her own transgressions (“Liar”) or mourning a fallen friend (“David”), Maryse Smith writes and sings with a rare combination of wounded grace and forceful reserve. Poetic, engaging and emotionally charged, Maryse Smith is an album worth waiting for. But, thankfully, the wait is over. Maryse Smith celebrates the release of her new album with a show this Thursday, October 18, at the Monkey House in Winooski. 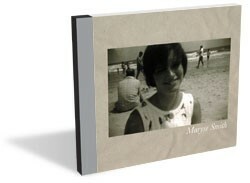 Maryse Smith is available at marysesmith.bandcamp.com.